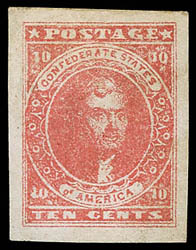 Confederacy, 1862, 10¢ rose, Sperati Reproduction, gummed, large well balanced margins, Extremely Fine; signed Sperati in pencil on reverse. Scott No. 5R Estimate $150 - 200. 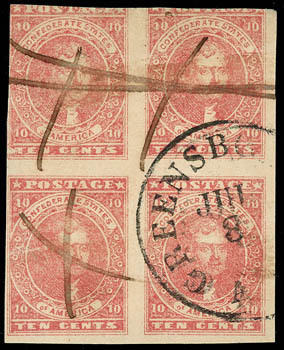 Confederacy, 1862, 10¢ rose, Sperati Reproduction, 2 singles, one with target cancel, other unused, ample to large margins, Very Fine; both signed Sperati in pencil on reverse. Scott No. 5R Estimate $300 - 400. 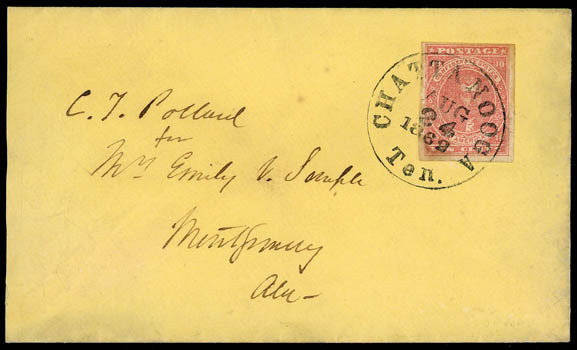 Confederacy, 1862, 10¢ rose, clear to large margins, tied by neat "Chattanooga, Ten., Aug 24, 1862" cds on cover to Montgomery, Ala.; cover reduced at left, Very Fine and choice. 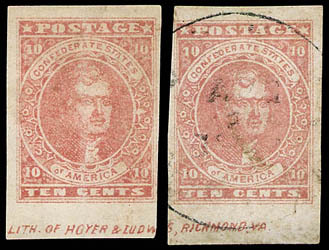 Confederacy, 1862, 10¢ rose, two singles, Positions 45 and 46, each with huge bottom sheet margin, other sides large to clear, first with "Lith. of Hoyer & Ludw(in glassines)" portion and second with "g, Richmond, Va" portion of imprint, position. 45 also showing white arrow variety and unused, vertical and horizontal creases, other used cancelled by light cds and with a couple tiny thin spots, Extremely Fine appearance. Scott No. 5 Estimate $1,500 - 2,000. 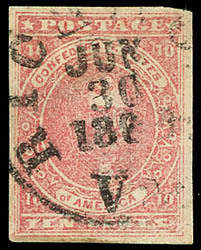 Confederacy, 1862, 10¢ rose, four margins, cancelled by central strike of "Richmond Va., Jun 30 1862" cds, which is the last day of the 5¢ rate; light horizontal crease, Very Fine appearance. Scott No. 5; $450 Estimate $300 - 400. 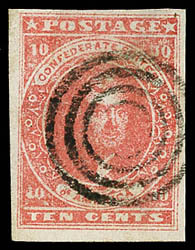 Confederacy, 1862, 10¢ rose, wide margins to clear at top and bottom, small nick at bottom, cancelled by partial Salisbury N.C. cds and three strikes of United States "Due 3" handstamp signifying use on a through-the-lines use; creasing and tear, F.-V.F. appearance. 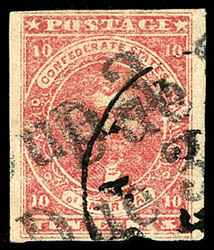 Confederacy, 1862, 10¢ rose, neat town cancel, clear to ample margins, brilliant color, certificate mentions slight tone spots which we find no evidence of, F.-V.F. ; with 1981 P.F. certificate. 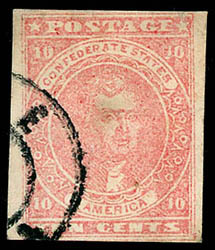 Confederacy, 1862, 10¢ rose, block of 4, Greensborough, Ala. town and manuscript cancels, margins large to in at upper left and top, strong color, tiny sealed tear in bottom left stamp, Fine appearance, this being the largest used off cover block recorded, ex-Frazier, Nunnelley and Powell. C.S.A. Catalog No. 5 $10,000. 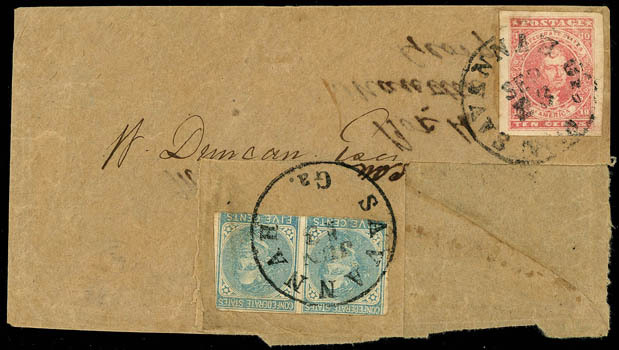 Confederacy, 1862, 10¢ rose, huge margins, tied by "Savannah, Geo., Paid, Sep 23" cds on 1862 brown turned homemade cover to Marietta Ga. at the 10¢ rate, inside use bearing 5¢ blue (7) horizontal pair tied by sharp "Savannah Ga. Jun 18" cds to Marietta Ga.; cover cut to display pair, Very Fine. Scott No. 5 Estimate $750 - 1,000. A CHOICE TURNED USE WITH A SUPERB EXAMPLE OF THE 10¢ ROSE. 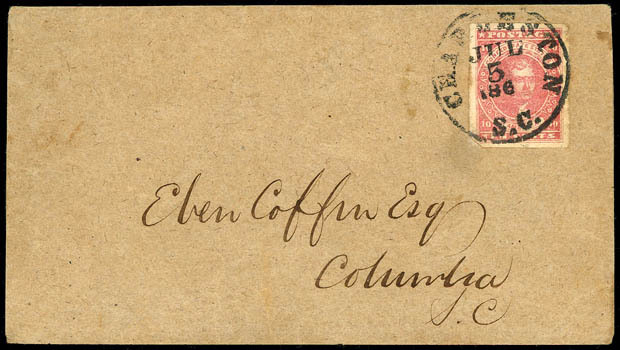 Confederacy, 1862, 10¢ rose, beautiful bright shade with extra large margins except lower left corner trimmed, tied by "Charleston S.C., Jul 5 186" cds on 1862 homemade brown cover to Columbia S.C. at the new 10¢ rate, fresh and Very Fine use, ex-Kohn. Scott No. 5 Estimate $500 - 750.